Dec. ’15 – Madge & Conrad’s first visit back since Sept ’14. Welcomed back by the community with flowers and lots of singing and dancing! March 2016 – The construction of the trench for the water pipeline has started. 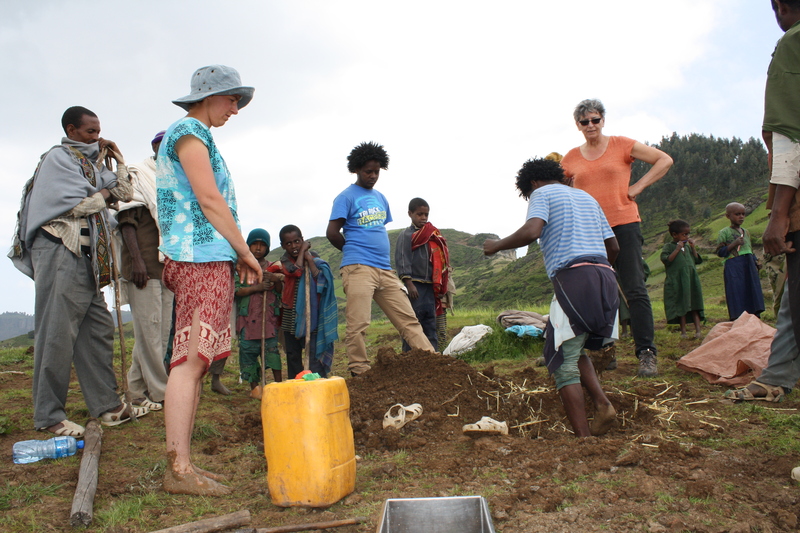 With picks and shovels the local community is digging 2.5 kms from the spring to the school site. Now that’s a commitment to building a better future for their children! Joining lengths of pipe for the 3 km journey along the edge of the escarpment. What a great team work! THE FIRST SEEDS ARE PLANTED!!! 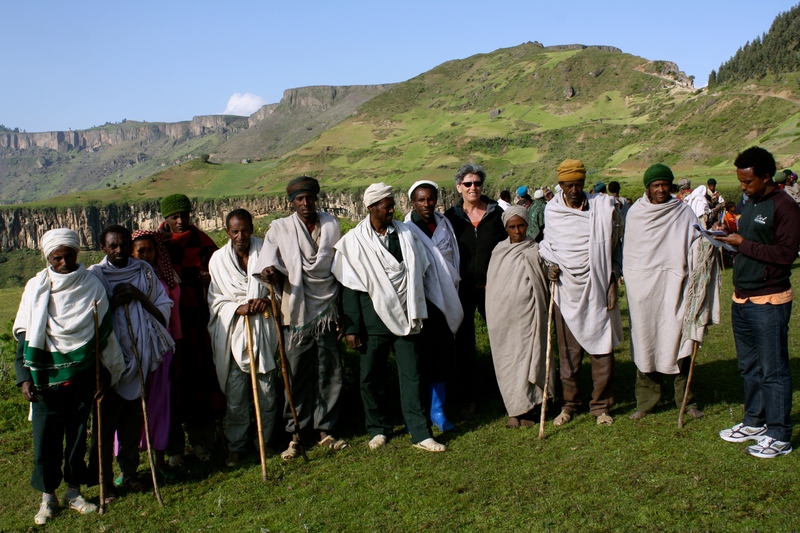 After conversations with the community about what aspects of their farming landscape they would like to change, they decided to focus on two areas this year: tree planting and growing vegetables. In March the community held 3 days of workshops on tree planting and received training from our director Sisay about tree uses and benefits, tree species, and techniques for integrating trees into a farming landscape. The community then decided which species they would grow and where to plant them. The trees have been ordered and will be planted when the big rains start in July. In May a workshop was held on vegetable growing. Last week Sisay gave a demonstration on preparing the soil, sowing seeds and mulching. 5 farmers then established veggie plots, growing Ethiopian cabbage (like kale), cabbage, carrot and garlic for the first time. They also purchased watering cans, sharing the cost 50/50 with FOTH. It is anticipated these changes will help with food security, livestock health, wood shortages, erosion, and potentially generate some income. 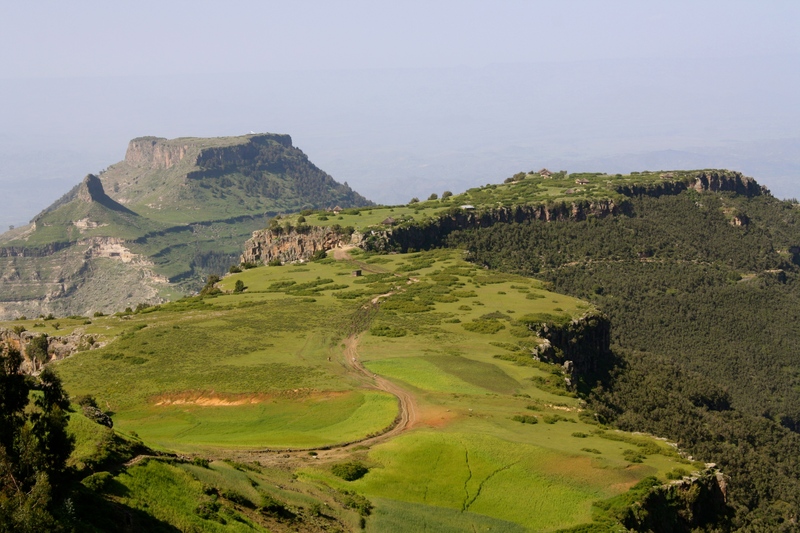 We also hope success this year will sow the seeds for ongoing farming adaptations and landscape restoration. July 2016 – The rain season has started and the farmers have been busy planting vegetable seeds in their plots. Many thanks to our director Sisay who has held several workshops on how to prepare the soil, sowing seeds and mulching. 2017 started with a productive visit by FOTH member Leila. 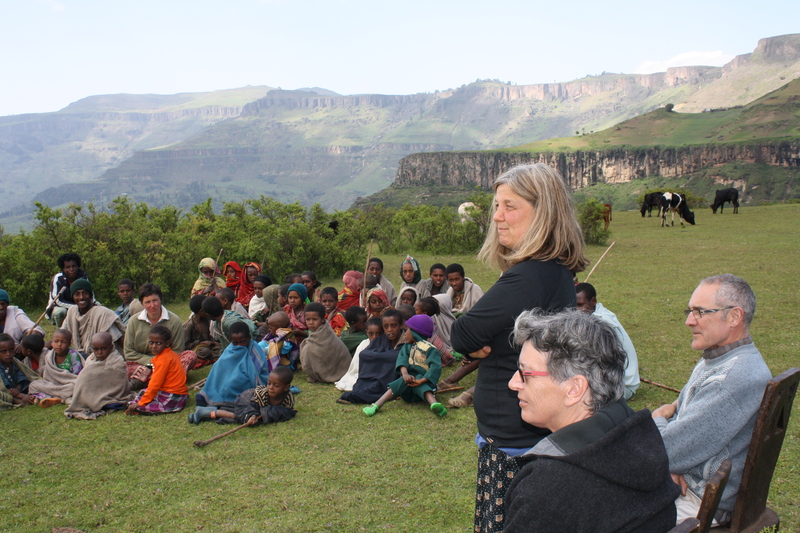 Leila caught up with project director Sisay in our local office in Lalibela and together they spent several days visiting and consulting the community in the Hudad. Leila consulted with the community about where on the site they would like to situate the various buildings, the playground and vegetable garden and orchard. She inspected all of the water system, which is complete except for the second reservoir and the pump. She also visited many of the village compounds to see how the trees and vegetables are growing. Unfortunately some trees have been eaten by goats, however most are thriving and the farmers are very proud of them. This year farmers will receive double the number of trees, but only if they have a suitably fenced area to protect them from livestock. 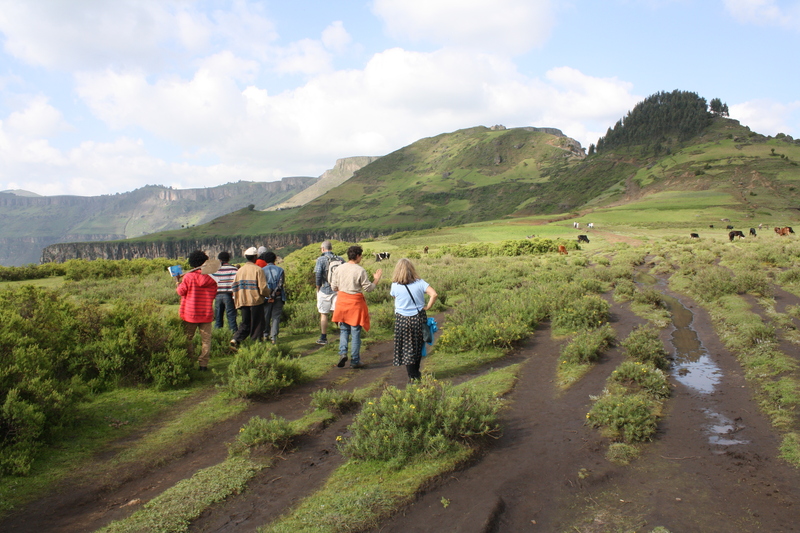 They have also fenced 2 large areas of grazing land to create closure areas, so that they can naturally regenerate and be sustainably managed in the future. About 50% of farmers grew a successful vegetable plot of carrot and cabbage. 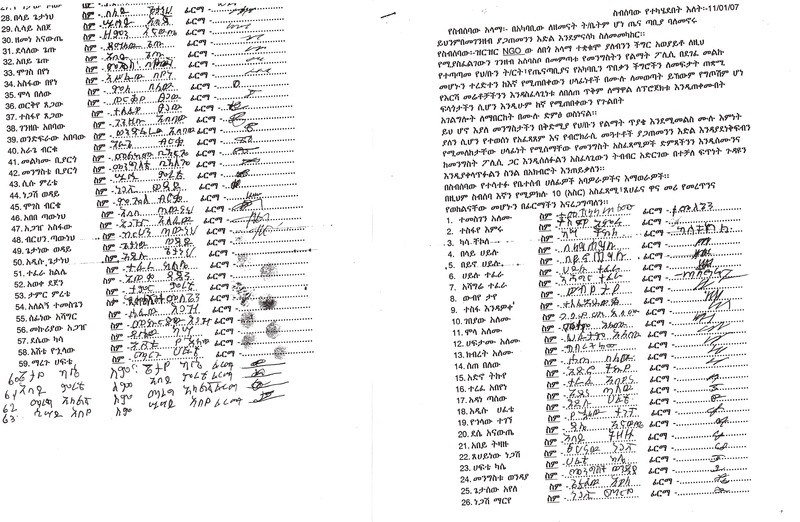 After satisfying family needs, they were able to make a profit of 100birr ($7) or more from the excess. This year the farmers will begin constructing terracing on their farmland in a 50/50 cost share with FOTH. They are enthusiastic as ever and extremely keen to see the school construction start in March. The first build crew are now deep into preparations, packing and planning before they head over and undertake the first stages of construction for the new school. It is a truly international contingent with 6 members from Australia, 3 from the UK and 3 from the US coming together at various stages on the plateau over the next month. The locals have been busy preparing the stonework which will be used to construct the walls. On arrival a solar pump will be fitted to the new water reservoir to pump the water the 3 kms to the school site and then construction can get underway. 12 volunteers from Australia, U.S.A. and the UK travelled to the plateau to commence construction of the school building and to work on the water system. 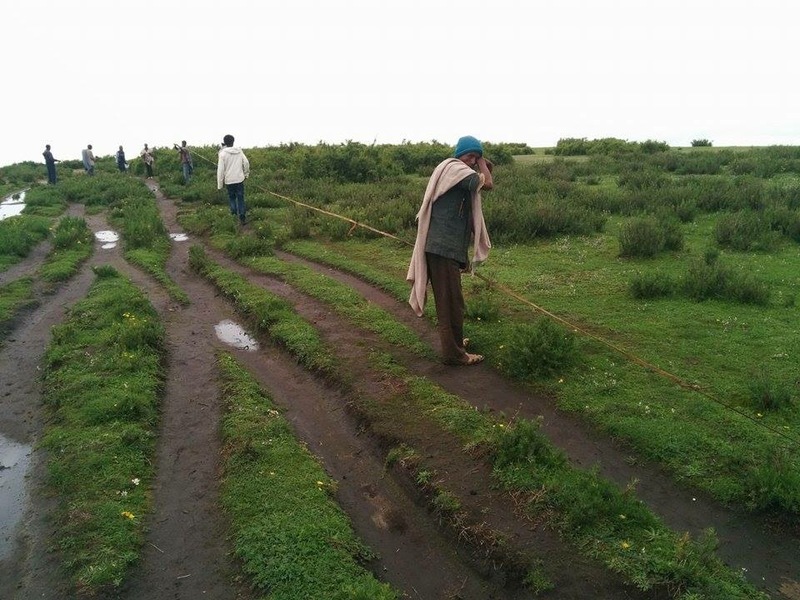 After an initial community meeting to finalise the precise location of the school on the land granted by the local Council, string lines were set out and hand excavation of the trenches for the footings could begin. It very quickly became a buzzing construction site, where different cultures collaborated, new skills were taught and learned and many friendships made. Due to its remote location and lack of roads, all materials had to be carried up the mountain by donkeys and locals. 88 bags of cement (50kg each) & 3 truck loads of sand were carried up the mountain by local labour, up to 400 litres of water a day was carried to the site by a small group of women, 30m3 of basaltic black stones were collected from neighbouring fields for footings, and over 2000 pieces of limestone for the walls were quarried from the edge of the escarpment and shaped by stonemasons from Lalibela. Nic, Walt and Jennifer made the almost daily trek to the reservoir site to measure and design the solar panel frames, along with some help from Conrad and Madge. The panels will sit atop the reservoir and power the submersible pump to transfer water around the edge of the escarpment for 2.5 kms to the school reservoir. They also completed the plumbing connections from the springs to the reservoir and what joy for the locals when water finally flowed through the collection system into the recently constructed cattle trough. A great moment for FOTH also, as the water system, critical to the success of the school and sustainable agriculture programs, finally nears completion. We had another hugely successful trip to the Hudad in October. We had volunteers from Seattle and Australia spending a productive time continuing work on the first classroom and the water system. It was very exciting to be back at the Hudad for many of the FOTH members and volunteers who had been there before and super exciting for new volunteers to experience time in the breathtaking landscape and getting to know the local people. Great team work was done by all with the volunteers, who were formed into groups and had team names; there was the “Wall Team”, the “Truss Team”, the “Window Team” and the “Steel Team” later to be re-named “Team Water”. The water system is comprised of a reservoir about two kilometres from the school site where water will be pumped to a head water reservoir above the school and then gravity fed down to the school site. Each reservoir carries 25,000 Litres of water and takes about 72 hours to fill. The World Health Organisation standard for a school is 15 Litres per child per day. With 25,000 litres of water this means plenty of water for the students and teacher’s personal use for hygiene and sanitation, with additional quantities for a community orchard and vegetable gardens within the school grounds to provide food for school lunches. Clean water is essential for children to be healthy and supports their ability for regular school attendance. FOTH will be developing a water plan over the next few months based on the water, sanitation and hygiene (WaSH) document developed by the UN. One of the major factors that prohibits children, especially girls, attending school is access to safe, clean water and sanitation. This trip we had a visiting water expert Daniel Ndege who has been working in Ethiopia for the past 3 years as a WASH consultant. He has extensive community engagement experience, so it was great for Daniel to speak with the committee about what a valuable asset the water is for them, and how important it is to start planning for how to use it wisely and productively within the community, and how it could be a source of income when the community garden gets going.Â Daniel will be writing a report for FOTH on the water system which will be invaluable in planning for the next phase of the project now that the school is almost operational. Three years of hard work is coming to fruition. We started building the first classroom in April 2017. Construction was completed this trip with three plumbers from Kennedy Plumbing working tirelessly to complete installation of the roof for the official opening on Saturday the 21stApril. 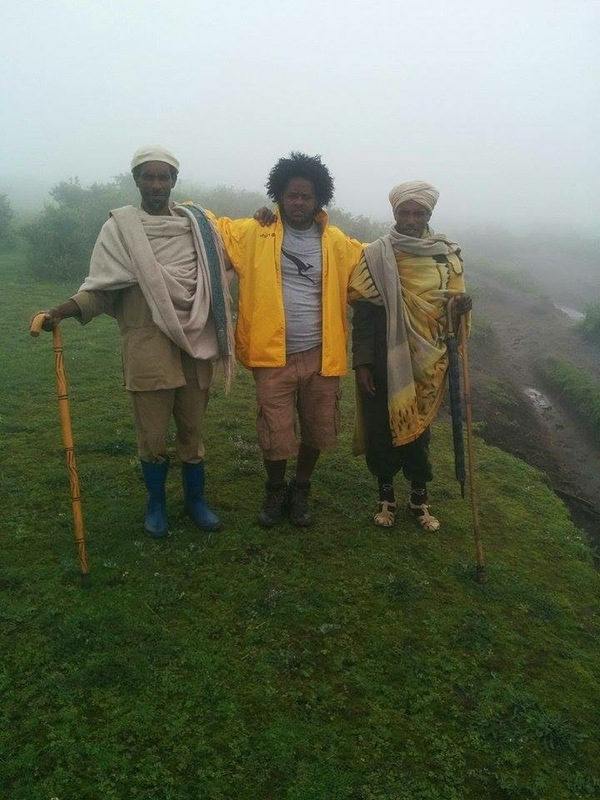 Allan and “the lads” were ably assisted by Hope and Michael along the way, as well as by our interpreters/supervisors: Temesgen, Endalew, Workye and Eyayaw. 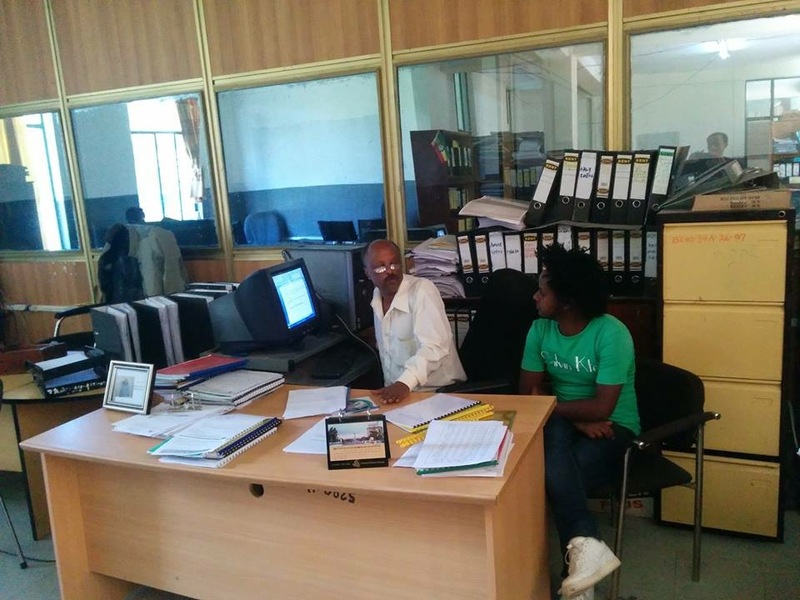 The 25 desks were fabricated by students at the Lalibela Technical College, and true to their word, they were ready a week after we ordered them. Farmers from the four villages went to collect them on Friday morning and carried each one up the arduous track on their backs, arriving mid-afternoon, ready to arrange the classroom for classes on Monday morning. 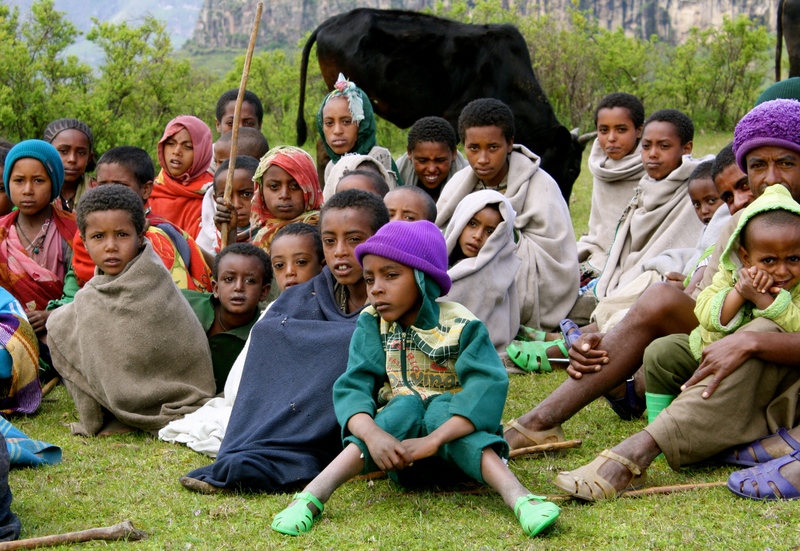 The students and teacher, as well as other members of the community, were overjoyed to see them arriving on the plateau. We had originally planned to make a start on the girls toilet block, but after some discussion and community consultation a design was agreed on where the boys and girls ablution blocks will be in the one building separated by a tall internal wall. This meant we were able to cut down on materials and construction time making the ablution block quicker and cheaper to construct. The pit has been dug and stone walls built up to ground level for the “Alternating Pit” composting toilet design based on plans from Unicef. We also started the main front wall, which acts as a privacy wall for the toilet cubicles placed behind it as well as the handwashing area at the front of the wall. Plumbing for the taps was placed in the wall as the stonework reached an appropriate height. By the time we left there were only a couple of courses to complete the 11metre long wall. The taps were fitted and are now the main source of water to the school site. At 3:50pm on Tuesday 24thApril, water officially arrived at the school site. Water pressure is similar to town water, gravity fed from a holding reservoir high above the school on the next hillside. Water flowing freely was a sight for sore and dusty eyes after three years of design and construction work. Foth started this part of the project in early 2015. With the water running we could detect any areas that needed attention, and many hours were spent checking the pipeline and fixing leaks. By the time we left we were confident that the whole system was working well. We have consulted with the Hudad Community Committee about how the water is to be used. It was agreed that all water will be used exclusively for the school site until the end of the year. This will include irrigating a new vegetable garden and orchard that will be planted over the next couple of months by the community. Water use will be monitored to work out the school water needs before water can be provided to other areas of the community. 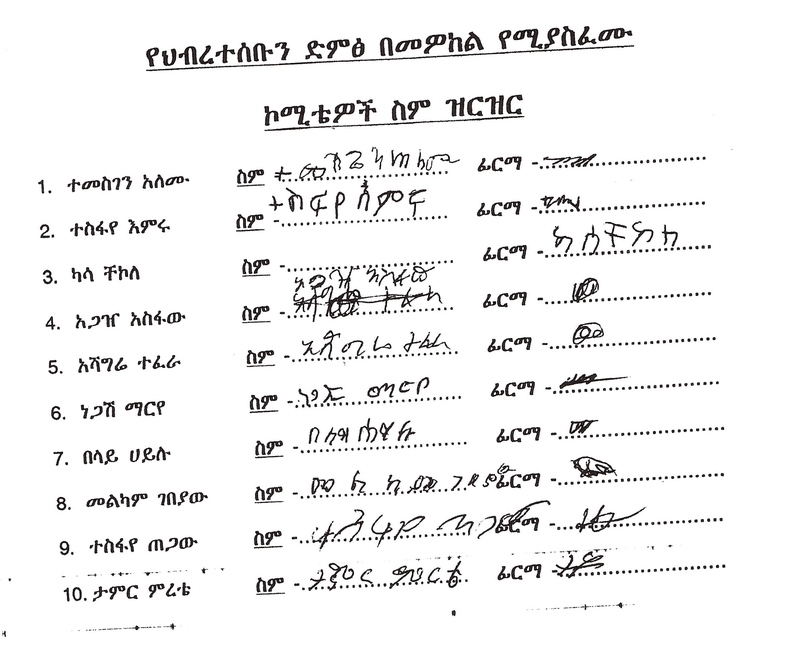 A Water Agreement was signed with the Community Committee before turning on the taps. The Committee is made up of representatives from each of the four villages that FoTH is collaborating with on this project. Plumbing and water outlets were installed at the future vegetable garden and orchard, and in the external wall of the ablutions block, which will have 8 fully operational taps once it’s completed. With the advent of the water system, the Hudad School Committee were quick to assist in plotting out the vegetable garden and orchard, an area of 70m by 30m. We were advised that a fence was essential to keep animals out and all got onto digging post holes and getting a fence up quick smart! 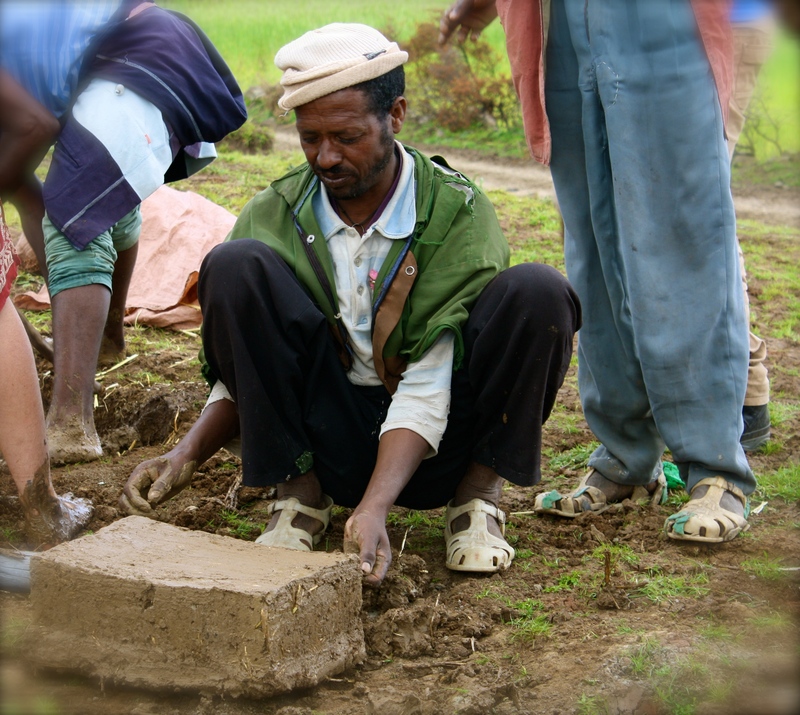 The community are now donating their time on a voluntary basis to plough the field and prepare the garden beds ready to plant seed that Foth Director Sisay purchased in Addis. Apple trees will be planted just before the rainy season arrives in July. Project Director Sisay has been busy purchasing and transporting thousands of seedlings. The community has planted Gesho and Tree Lucerne seedlings around the perimeter fence of the veggie garden to create a “living fence” to eventually replace the barbed wire temporary fence. The Apple trees will be planted in the school orchard this week, and Juniper seedlings are being planted as part of the reforestation work around their villages. Photos below show the locals tending to the veggie seedlings that are germinating well at the school, and in the 90 garden beds around their villages. With the rainy season well on its way everything is going brilliantly.